Astrophotographer Dan Stanyer of British Columbia, Canada snapped this view of a Geminid meteor from the roof of his car during the shooting star display's peak on Dec. 13, 2011. Die-hard skywatchers around the world caught a dazzling "shooting star" light show Tuesday night (Dec. 13) during the peak of the annual Geminid meteor shower. The Geminid meteor shower is often one of the best meteor displays of the year, but this year the event peaked just days after a total lunar eclipse and the December full moon, which threatened to wash out the sky show. But that didn't stop meteor shower enthusiasts from venturing out into the chilly December night for the celestial event. "Despite the bright moonlight I could see more than two dozens of nice Geminids during the two hours I could spend outside!" skywatcher and photographer Monika Landy-Gyebnar, of Veszprem, Hungary, told SPACE.com in an email. Landy-Gyebnar also had some critter company during her skywatching trek. Her photos showed bright streaks lighting up the night sky. "My only companions were two foxes who squalled near me talking to each other very loudly, although I could not see them, they might have been watching the Geminid shower among the bushes," she said. "It was a very good experience with much more meteors … so I can only suggest anyone to watch the sky as much as possible because bad circumstances are not always so bad!" The Geminid meteor shower is an annual sky show created by pieces of the weird asteroid 3200 Phaethon, which sheds dusty debris. As the Earth passes through this debris field each year, the space rock remnants burn up in the atmosphere to create eye-catching fireballs and meteors. The meteor shower appears to emanate from the constellation Gemini, which is where its name comes from. Landy-Gyebnar was by no means the only skywatcher to look up during the Geminids' peak. In British Columbia, Canada, photographer and amateur astronomer Daniel Stanyer braved the chilly December night and parked his camera on the roof of his car to snap photos. One dazzling fireball passed out of range of Stanyer's camera, but the next one streaked right across his field of view. "Right away I looked over at the camera to see if the shutter was open or not. It was a long wait to the end of the 15 second exposure from there. I was very excited to see that I had captured the entire thing, and called it a night right there," he said. "All in all I saw 21 in the hour I was out, with 12 of those the slow streaking kind, 9 dimmer faster ones, and the one fireball. It's been a great couple days with the lunar eclipse and now this meteor show." Skywatcher Mike Hankey of Freeland, Md., said the bright moonlight didn't put a damper on his Geminid experience either. "The shower seemed pretty active and this is the best crop of meteor photos I've had all year," Hankey told SPACE.com. "That is pretty amazing, considering there was a near full moon and we got clouded out at 2:00 a.m."
Hankey created a composite time-lapse photo that captured many of the meteors he spotted in a single image. "I captured 11 meteors on camera last night before the clouds came in," Hankey said. I put together a composite image with 7 of the best meteor shots. It turned out pretty good." NASA astronomers also got into the spirit of the Geminid meteor shower, with the space agency hosting a late-night webchat and live stream from all-sky cameras across the south-east. In a post-meteor shower wrap up, Bill Cooke, head of NASA's Meteoroid Environment Office at the Marshall Space Flight Center in Huntsville, Ala., said that clouds blocked much of the camera views Tuesday night. "However, we managed to capture a few images before viewing was obscure," Cooke wrote in a blog. Some eager skywatchers did not snap photos of the Geminid meteor shower, but were still amazed by the event. "I've only been outside for 1/2 an hour and I've already seen 9 meteors! WOW!" observer Stacey Mohamed wrote SPACE.com from Kissimmee, Fla. "I have made sure to watch every meteor shower this year and by far this is the best! Maybe it's because I'm a Gemini myself!" The next shooting star display to grace Earth's night skies will be the Ursid meteor shower, which peaks on Dec. 22. But skywatchers should wait until 2012 for more impressive displays. 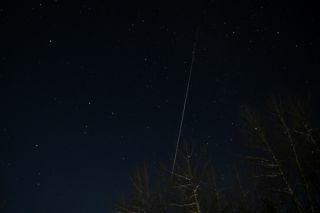 The first meteor display of 2012 will be the Quadrantid meteor shower, which peaks on Jan. 3.